I cant figure out how to change ringtones. See the pictures above. 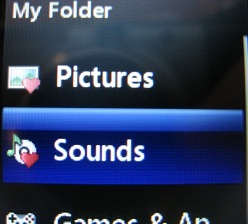 You just go to My Folder -> Sounds -> Default Sounds to see the included sounds. 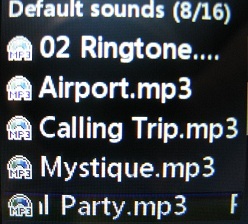 There are (I think) eight regular ringtones and 8 mp3 ringtones. 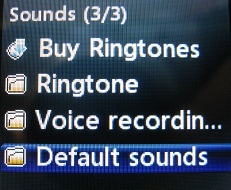 You can then set each tone as your ringtones, message tones, startup or shutdown tone on your LG 420g. If you want something different, you can always go to Tracfone's site and buy a new ringtone for about $3. Comments for How do i change the ringtone? Just use the arrow buttons to scroll to and highlite the sound/ringtone you want to use, click OPTIONS (the - button on the left), scroll to USE AS>, click the right arrow to bring up new menu, and scroll to the option you want to assign the sound to (Voice Ringtone, Message Tone, Start Up Sound, Shut Down Sound). Easy peezy. Just a note: If you want to create your own ringtones and upload them to your phone, use the 420G's Bluetooth feature and a PC dongle to send them to your phone. Also, try to edit them to just under 29 seconds long and less than 300kb, using a free program called Goldwave(demoware) or any other sound editing program you prefer. Or if polytone midi type ringers are ok, download them from the web and use Anvil Midi Studio Editor(freeware) to shorten them to ringtone size. One more note: You can find free ringtones (Truetone and Poly) at PHONEZOO.COM . They've never spammed my email or my cell phone after using them. It really surprised me that they didn't since downloading was free. People make the tones and share them there. I saw it on Facebook. So you pointed to the sounds. I got that part. What you didn't tell us was how to set the sound when the phone rings. Where's that setting?